Over the New Year I was down at my sister's place and she gave me a copy of some stuff that you placed on the Internet. Perhaps I should add a little and make a correction or two. Scots Gazeteer - there is King Edward which it says is a parish on the Devron and Forgue lies more or less on the Devron. The reason I was doubtful of the name of King Edward is that Edward I was known as the Hammer of the Scots & I thought it unlikely that a bit of Scotland would be named for him. The Gaelic meaning of Duffus I have also heard given out as the Black Place. The peat bog was drained around 1780- 1790 by Rennie or Telford - Telford likely. I've been scratching around the flat for a map of this area made at about that time - no luck so far but I'll send on a copy when found. Second page - the two black lawyers- the one in the West Indies is as far az I know right enough but I think the East African possibly is a little dubious-Dad would've known about him (I should explain that Dad & Willie were brothers) as Dad worked in East Africa from 1952-3 to 1968. Last page- a letter from Uncle Willie's wife June to yourself - she refers to Bill's people were in Scotland - the only Duffus to retain the name in Scotland from Dad/ Uncle Willie's family is as far as I know yours truly - my sister lives in London. Coming to the second bunch of paper- 5 pages of the family tree generation 2- there are 2 Ann Duffuses in the same family- my sister suggested that its likely the first Ann died quite young(perhaps stillborn)- it was apparently quite common for a later child to carry the name of an earlier one where the earlier one didn't survive. I have a dim photo of a gravestone connecting John, Charles & their father James - this & others I will send on at some point but they do take a bit of time with the eyeglass to even partly decipher. I checked on the name Tyrie (after a wild speculation that it might be a corruption of Turriff - perhaps not so daft- that place is locally known Turra - indeed there is a song about 'The Turra Coc'). Anyway, in the Gazeteer I find under Tyrie- parish, church 5m S.W. of Frazerburgh which puts it down about Strichen/New Pitsligo. As a last aside on the business of names not always being quite what they seem - there's a place - W.N.W of Turiff called Aberchirder -the locals know this one as 'Fogey Loan'! Generation No 3/8 William Duffus - my great grandfather- another photo deals with some of his family whose gravestone is in New Pitsligo. George of this family would be Uncle Willie's/my Dad's father(likely a photo of his gravestone - somewhere). Dad once told me- or maybe Uncle George- that Grandad had "come over the hill from Tarland". Tarland is in Deeside just above Aboyne. If he farmed in Deeside it would certainly be some farm flittin from Tarland to Auchcairnie - the most direct route is the Cairn '0 Mount road & most unlikely- the next road & a better one is to the East - known for some unfathomable reason as the Slug Road. It strikes me a better(but not necessarily more likely) way to move a farm would be by railway as both Tarland & Auchcairnie were at that time quite near to the rails. Same Generation - Thomas - my Uncle George(Willie's eldest brother)once handed me a pocket watch which I still have which was said to be one of Thomas'. Incidently, should you be interested in these things it has a cylinder escapement. I seem to remember that Thomas was a doctor and was killed in a car accident at Brig O Mondynes (on the old A90 ENE Auchenblae) - possibly in 1928 - this would have made him 66 - perhaps this may seem a bit unlikely until you consider that people like doctors and vets were among the first people to take up the motor car. Anyway it's by no means sure. Generation 4. George (my Grandad)- the Burns end of Grannies name might be worth a look at-Dad mentioned the Granny was actually a Burness - took us to Arbuthnott churchyard to see a gravestone - this apparently was Robert Burns' father or more likely grandfather & the link though tenuous is there. OK. Arbuthnott is between Fordoun & Inverbervie. Oh yes, Auchenblade should be Auchenblae. An alternative spelling is Auchinblae. George Milne Duffus - married only once to Jessie Lawson. No issue. Aunt Jessie died 1980 - 1981. Uncle George 1983 - both in Prestwick, Ayrshire. John Duffus born 1913 (not 1914) - day & month OK.
Dad had a stroke in 1980 and died in 1982 in Nairn (east of Inverness). Robert Wallace Milne - was a radioman on board passenger ships before the war (say 1938-1939) & for awhile at least on petrol tankers running between the Red Sea & the Gulf. Indeed, I remember a hair-raising story he told me once about this - perhaps later if you're interested. After the war or a bit after that he left the sea & bought a company called My Lady Dyes on the (lousy) advice of Auntie Margaret's husband - the company folded & Uncle Bob ended up as a shorebased radioman at Wick radio station in the very North of the mainland. Oh, all for now - I am off for a jar! 13th Jan. Where was I - ah, yes - Uncle Bob - never married & there were no kids - at least none known & how do I know he was given lousy financial advice? - Dad said so & had plenty reason to back it up with. Next - James Alexander Duffus - as far as I know always called Alex. He would be most unlikely to have been born in France - although that is where he was killed at the 'loops of the Seine' as it was described to me. Whether he was born at Castleton or Auchcairnie I don't know - they were first at Auchcairnie, moved to Castleton & moved back to Auchcairnie - possibly Granny had twigged that Grandad might have been a good farmer but was not much a businessman. Alex is unlikely to be buried at Auchenblae (& certainly not at Auchcairnie which is just a farm). He is on the gravestone in Auchenblae but at that time as they had done for centuries - they just buried their dead more or less where they fell. The remains therefore will be somewhere WNW of Paris - the way the story goes he was pretty badly shot up dying thereafter & yes, the position was taken. There is a good chance he was in the Black Watch - I must try & get up the Castle where they apparently have records of these things. There is another reason why Alex will not be buried at Auchcairnie - Granny & Grandad left there - my guess is about 1929 - 1931. They moved out of farming & lived at Denhill House, Auchenblae. I've just raked a fragment of a map of France with a faint red pencil ring - I strongly suspect this is where Alex got killed - just West of Rouen-Sotteville is a wee place called Yville-sur-Seine. Next, Margaret Duffus (Dad's sister & he was forever pointing out - his ELDEST sister - this referenec to age used to get right up my aunty's nose - she was just a trifle pompous!). - anyway Loring should read Lorna - last heard of living in Tillycoultry just east of Alloa. Ailsa Turner I'm afraid never married - she died at childbirth or shortly after. Phew! - nearly done - what you make of all this I know not but yours truly is getting a little wall-eyed. It must've been a hell of a lot of work for you to have brought all of this & the rest together. Anyway - Allons-y! 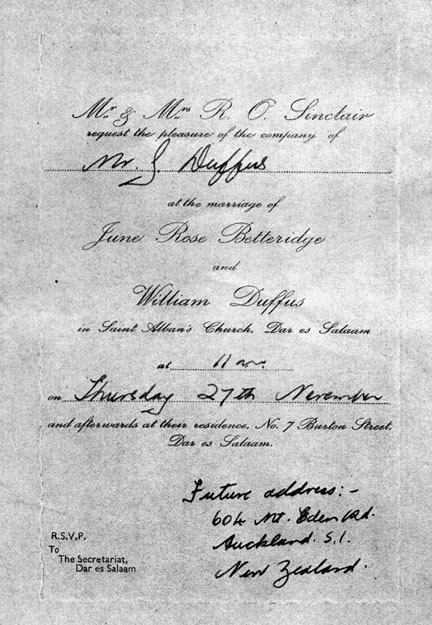 John Duffus (my old man & of course my sister's too) Married (1) Maria Edith Sophia van Berckel (Riet for short!). Married (2) Amelia Laws. Children - the Gerald bit should be Gerard born - 13/3/47 Colombo, Ceylon. Linnie is a family name for Marilyn (yes, apparently after Monroe more or less on the spur of the moment) born 1948 Columbo, Ceylon. Neither of us had kids or got married & are unlikely to do either now. Mind you, Linnie has been living with the same bloke for over 20 years. As for me to cut a long story short she left after 6 years and there ain't really been anyone since. Ah well - what's for you willnae go by you. Last page - Duncan married Pam Stansfield. Has been married twice since - I shall say no more there! Lorna right enough married grant they too are apart - have been for a long time - and I won't say much about that except that its one of the better things that happened to Lorna. The Proceedings of the Society of Antiguities of Scotland (Proc.Soc.Antiq.Sect.) Volume 124 (1994) pages 379-390 have plans, photographs, history of Duffus castle. Minnonie which is mentioned on one of the New Pitsligo graves is likely just South of Gardenstown. The next two places I've made a couple of notes on while at my sister's place - why I cannot think but I'll mention them in case anything clicks - Aberdour is between Gardenstown & Rosehearty. Alvah is at the back of Banff. Duff House is unlikely to be connected - built 1735 & now partly restored. It is possible there's some connection with Aberdour in Fife. For some reason the name Cushnie is very familiar but I can no longer tell why - it's near Gardenstown. There is another W. of Aberdeen. Netherton - the only one I can find so far is on the B9134 S.W. of Brechin. As far as I remember what is now Duffus Village is actually what was once New Duffus - the original old Duffus was inside the area of an airfield built WWII - indeed I seem to remember when Dad took us there in 1957 there were roads that just disappeared under the wire. The old map I spoke of earlier I haven't found but for some reason I've a photocopy of its bona fides which I will include. Perhaps the map library here will have a copy - if I get sufficiently organised to get down there. The Gazeteer I spoke of published by Johnston & Bacon my (third) edition published 1973. First published 1937. SBN 7179 4549 9. Why its just SBN instead of ISBN I know not. All the photographs were (thankfully) taken by others and given to me - should not I suppose to look a gift horse in the mouth - I know the chap who took most of them quite well & he is a good sort - but no photographer! Still, as I said with the eyeglass you can decipher quite a lot & I shall try to do so before I send these on. As you may have guessed earlier I have a passing interest in clocks and watches (indeed I have nearly finished making a pair of circa 1900 electro-mechanical clocks) so eyeglasses I have in various strengths. Ok enough for now. 19th Jan. Slight hiccup there- doing some repair work on this old anvil- the line feed mechanism gave up. Ah, yes- the Netherton mentioned at the top of the page is likely not of any relevance. I've tried to decipher the gravestones as far as I can make out but I wouldn't accept it as definitive. I've included a couple of songs from a book I have- largely because they are from that area - it strikes me that both are not very flattering about their respective farms. One thing about that- in that area - say a NE line from about Arbroath to Nairn - the farmers themselves are very often referred to by their farm names and not their own name.. I came across an odd usage (and pronunciation) the other day in a book called Surfing on the Internet by someone called Herz or Hertz - possibly a pseudonym - which used the word dufus as to mean idiot or fool. Page 19 if you want to look it up - was published about 1995. Mind you, I've had my surname spelt wrongly quite a few ways although it seems to happen less often in the last ten years or so. I daresay you've had the sane yourself. Well that about wraps it up - if this lot is of any use well & good - you must use it as you see fit. And many thanks for taking the interest and trouble to collect all that stuff - I hope it's been worthwhile. Oh, no use looking for me on the Internet(or whatever it's called) - I'm not there - yes, there's a 486 lying there but even if it does eventually come back to life I can't see getting a modem and all that stuff - I'm one of those people who uses cheques & not credit cards & preferably uses cash - shopping on line - not for me, even if I did write my own programs 30 years ago - Algol which I thought a wonderful language. Never hear of it now. I'll get this lot photocopied (so's if I do come up with some more I won't repeat myself) & send it off to you. Just found some more - it would appear Dad/Willie's family did not go back to Auchcairnie - they were at Castleton 1917-1931. 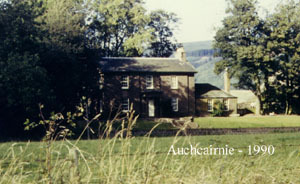 The house photo is Auchcairnie as it appeared about 1990. Also came across an invitation to dad to go to Uncle Willie's wedding in Dar es Salam. I'll send a copy - there's a bit of a story about this one - I am reminded of it by the E-mail you got from some wifey who was wondering about some title or other - the last so-called chief of the clan was mentioned in an article in the Scots Magazine sometime in the 70's - he died I think about 1850. Any other titles etc. will hardly be worth the paper they're written on - as you can buy titles from around L15 - L150! See the ads in the back of Private Eye. Anyway about Willie - apparently at his wedding reception (possibly playfully - possibly after a drink or three) Willie started putting it about that he was clan chief - father was not slow to disabuse him of entertaining any such ideas - Dad could be, or, forceful at times! Dad did have a few pet hates - titles didn't impress him too much & he detested Freemasonry. I thought that was me finsihed - but I've come across one or two other things - Alex it appears was not in the Black Watch but the Gordon Highlanders - I think he joined up a good bit before the war but have no idea what his service history might have been. Uncle George was R.A.O.C. was at Narwick & then was posted to Iceland. Akureyri, I am pretty sure. Back to UK then Europe. Dad was a captain & latterly major in the R.A.S.C. attached to 50(Tyne-Tees)Div. First in the Western desert & got pieces of his anatomy removed 2 or 3 times by shrapnel. Then Scily, Italy, back to the UK & then Europe - he went in on D+4 actually. Also there's a photo of Auchcairnie in about 1990 - I have a photo of Auchcairnie taken in 1913 but where? is the problem. A common one in this flat as I rarely throw anything out - as you will have guessed from the paper - not that I am one of these 'green' types - I was just brought up not to waste things - I still have for instance most of the tools I bought when I got my first motorcycle - a 500 BSA - when I was 12 - I get the feeling that wouldn't be done now - still there was a disused WWII airfield up the bank where I lived & could run about until heart's content.